They rose to protect their nation breaking social norms and customary traditions. They stood up against oppression and fought side by side with their male counterparts. They succeeded on numerous fronts showing determination, resilience and fortitude. 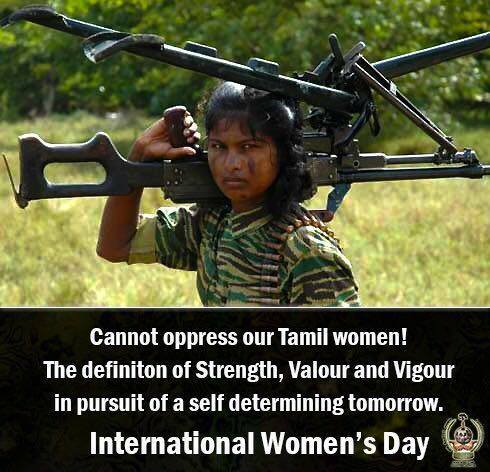 They are the women of Tamileelam. – Kala, a 23-year-old women cadre, on why she joined the LTTE movement. – Tamilini, a former LTTE front-ranking soldier. – Malaimahal, a well known LTTE cadre. “The previously omnipresent notion that femininity is directly connected with passivity, indecision, softness, and emotionality, while masculinity is tied to aggression, independence, rationality, and activity, is no longer accepted by the majority of Tamil society. Today, we must as a diaspora cover for the destroyed institutions of LTTE and help our extremely intelligent, capable but destitute civilian and ex-cadre heriones living in highly militarised Eelam. We must not allow the role of women to denegrade post war through the sinhala soldiers’ misogyny coupled with Tamil patriarchy.